Welcome to patch 5.24, the last one of 2015. Itâ€™s been a wild ride with Cinderhulks, Juggernauts and Devourers in-between, but this is no time to get sentimental. Itâ€™s still preseason, there are still outliers to balance, systems to maintain and bad jokes to make. Speaking of balance outliers, weâ€™ve got a lot of balance changes below for champions you might not see often – letâ€™s dive into that for a bit. Like preseasons past, weâ€™ve traveled (via the diversity dirigible, naturally) to an entirely new ecosystem of champion balance, where many old â€œchampion powerâ€ assumptions just donâ€™t hold water. A moment of silence, please, for 4.20 Warwick and six-Cleaver everyone. New systems, masteries and items combine to make weak champions strong, strong champions weak, and Brand a god. So while it may shock you to see champions like Swain and Anivia nerfs, or Riven buffs (gasp! ), keep in mind that weâ€™re working off of as much objective data as we can. Donâ€™t worry, we didnâ€™t forget. With that out of the way, what else is there? Poppyâ€™s looking cuter and more imposing than ever, Snowdownâ€™s back and brought the Legend of the Poro King game mode with it, and weâ€™ve put the finishing touches on our item and champion tuning before taking a balance break to January. So, from all of us at Riot Games: good luck, have fun, and weâ€™ll see you in 2016. Snow Day Bard will be available in store for 975 RP until January 10th, 23:49 PST. Afterwards he’ll return to his regular price ofÂ 1350 RP. Snow Day Bard isÂ NOTÂ legacy. Snow Day Gnar will be in store for 975 RP after Patch 5.24 hits live and is a legacy skin. Snow Day Syndra will be available in store for 975 RP until January 10th, 23:49 PST. Afterwards she’ll return to her regular price ofÂ 1350 RP. Snow Day SyndraÂ isÂ legacy. Now applies the “Chilled” debuff (double damage from Frostbite) for 1 second, decreased from 2. Meeps recharge cooldown decreased from 10 seconds to 8. AP Ratio increased from 0.2 – 0.3 to 0.45 – 0.6 (depending on time spent on the ground). Stacks needed to charge Headshot changed fromÂ 7/6/5 (values for levels 1/11/18) to 6 at all levels. Cap on damage against monsters decreased fromÂ 300/400/500/600/700 toÂ 300/350/400/450/500. Bonus damage is no longer dealt to towers. Health changed from 695 [+95 per level] toÂ 670Â [+90 per level]. No longerÂ letsÂ Hecarim ignore unit collision. Now allows Hecarim toÂ pass through units for the duration of the charge. Cooldown changed fromÂ 150/130/110 seconds to 160/130/100. Now deals an additional flat damage of 2% (of targetâ€™s Max HP). Maximum base damage increased fromÂ 150/210/270/330/390 to 180/232.5/285/337.5/390. Clicking beyond minion waves will no longer make Rammus try to move around them while in Powerball. Base Health-per-5Â increased from 3.34 to 5.34. Tooltip no longer mentions that Flamespitter deals halved damage to jungle monsters. Total AD Ratio increased fromÂ 0.5/0.55/0.6/0.65/0.7 to 0.6/0.65/0.7/0.75/0.8. Total AD ratio decreased from 1.0 toÂ 0.6. Cast range decreased from 950Â to 800. Mana cost increased 20/25/30/35/40 to 40/45/50/55/60. No longer removes Grievous Wounds from allies. Root duration decreased from 2 seconds at all ranks to 1/1.25/1.5/1.75/2. Base damage decreasedÂ from 60/110/160/210/260 to 60/105/150/195/240. Bonus damage to structure increased from 150% to 200%. Health decreased from 600Â to 500. Cooldown increased from 61/48 seconds [values for levels 9/18] to 76/60. Total Cost increased from 2700 Gold to 2800. Total Cost increased from 2500 Gold toÂ 2600. Armor decreased from 12 to 10. Armor increased from 9 to 10. Gold granted increased from 50 to 70. AP ratio decreased from 0.06 to 0.05 (damage-per-second). Duration of DoTÂ for AoE spellsÂ increased from 1.5Â seconds to 2. Bonus to Movement Speed while moving in brush or river increased from 12 to 15. Cooldown increased from 20 seconds to 25. Spells now only generate stacks if they hit enemy Champions, not whenÂ they’re cast. Stack duration increased from 5 seconds to 6. Bonus to Armor Penetration increased fromÂ 0.6/1.2/1.8/2.4/3 [+ 0.06/0.12/0.18/0.24/0.3 per level] to 1/2/3/4/5 Â [+ 0.1/0.2/0.3/0.4/0.5 per level]. Bonus to Armor and Magic Resist decreased fromÂ 1.2/2.4/3.6/4.8/6% toÂ 1/2/3/4/5%. Bonus health decreased fromÂ 0.8/1.6/2.4/3.2/4% toÂ 9/18/27/36/45 (flat). Level is taken from the highest between the caster and the target. A couple months ago we rolled out persistent chat rooms onto the PBE. This was an early test for building the foundation for new social features we announced with the 2016 Season Update. As we officially move forward, weâ€™ve updated the name on PBE to reflect that these â€œchatroomsâ€ have evolved into our earliest version of clubs. What are clubs? They are player-named, player-organized, and player-controlled social groups. The long-term goal is to help you head into games with the right teammates every time by helping you find like-minded players to compete with. We plan on building a whole lot more on top of the current functionality of clubs but right now weâ€™re starting simple. Just like â€œpersistent chat roomsâ€, you can own one club and be a member of three at any given time, with all the same moderation tools. With this first update, you can now set a tag for your club that can be displayed in various places including your Hovercard, and more importantly, in game. Ranked team tags will still take precedence in ranked team games. Since you can belong to multiple clubs, you now have the option of setting a club to be active, which means that clubâ€™s chat room will open on login, and other players will see that affiliation. We plan to push out updates to clubs as they become available (which means weâ€™ll need to occasionally reset all clubs), so take a look and let us know if clubs make it easier to stay connected in League with friends! We’ve made a few changes to minion blocking this preseason, targeted at making creep block more intuitive. When you get stuck in a minion clump you should be able to understand what’s happening, and your champ’s attempts to escape (or avoid) it should make sense as well. While these changes technically worked, they caused problems when interacting with other systems. We’re turning them off until those interactions are fixed. [ EVERYTHING OLD IS NEW AGAIN ] All minion pathing changes made in 5.22 and 5.23 have been reverted. Weâ€™re right back to pre-preseason while we work on a better implementation. We made some behavioural changes to minions in the very first wave of the game when no enemy champions have interacted with them. Left to their own devices, the minions will spread damage evenly and avoid randomly focus-firing a single soldier. The goal here is that you should be able to more predictably realise whether or not youâ€™ll lose a minion when you get to lane late. This actually went out in 5.23, but we figured youâ€™d like to know! [ FIRE EVERYTHING ] Minions wonâ€™t gang up on a single enemy minion when no enemy champions are present. Poppy’s Q&A on the NA Boards has concluded. You can find all the developer answers below. For an in-game preview of Poppy’s rework, check HERE. We’ve gathered a bunch of the folks who worked on Poppy for some Q&A about the Keeper of the Hammer! Whether you’re interested in Poppyâ€™s gameplay, story, art, or sound, ask away and we’ll be happy to answer! Poppy, Keeper of the Hammer: Check out Poppyâ€™s reveal. Champion Insights: The story behind Poppyâ€™s champion update. The Arsenal: Forging Poppyâ€™s Hammer. A Heroâ€™s Calling: A weapon holding the hope of a kingdom has found its champion. She just doesnâ€™t know it. One I remember is a global ally targeted AOE knockback that had separate cooldowns for each ally. I was toying around with the idea of her being a superhero who swings in to save civilians in distress. Finding a noble Demacian hero that did not feel like a mini-Garen, that wasn’t easy. The power of the ability is in the massive distance (or knockup), so we prefer if it didn’t do tons of damage. We wanted to keep this from becoming a better Lee Sin R or the like. I think she has the tools to become one. Not now, we may do it depending on how the currently ongoing attack range increases are going. There were about 20,000 sports skin ideas thrown around, with slugger being the obvious one. Poppy’s W will stop only one dash per champion per cast. The team wanted to make sure she doesn’t look like A relative to Tristana. And so Poppy have her own unique space visually. To make her ultimate SFX I went to the local hardware store and bought a bunch of bricks, cinder blocks and a really big hammer. I then brought it into our Foley room and Poppy ulted all over the place. She says that to all Yordles. XD But she generally feels yordles are too disorganized — she’s definitely drawn to orderliness of Demacia. Hello! Regarding the music – we really wanted to capture both the Demacian and the Yordle aspects of Poppy. We ended up really liking the contrast of the low brass representing the strength and seriousness of her Demacian side and the playful flute for her Yordle roots. The first few theme ideas ended up sounding too solemn, but when I experimented with playing a lighter, more uplifting (Dorian), sprightly variation of Demacia Rising on flute, the piece fell into place. There is also the element of the flute not fully fitting with the low brass and the rest of the orchestra which I believe to be very fitting for a Yordle in Demacia. In League’s past, Meglings were a separate race from Yordles. Quickly into the game’s release, we genocided unified Meglings with Yordles, making them a single race. Tristana and Poppy are both Yordles, but have no direct relation to each other. Personally–and I’m not the narrative writer, so this is just an opinion–I find Poppy’s new story to be very endearing. It’s very human (yordle?) to be confident, but also not understand your own strengths. She’s a badass yordle with Imposter Syndrome! I had the most fun working on her, I think. Yordles are always the best candidates for this kind of thing (big heads = lots of visual real estate) but people seem to love it (us too! ), so we’ll do our best to look into adding it where we can. No Promisesâ„¢, but we’re always looking for opportunities to make champs more expressive! The legacy skins will be made available for a limited time once she goes live. Yordles have trait varieties, think about how many dog breeds out there and they look completely different from one another but they are still dogs. Same goes for yordles. They could have different ear shape/positioning also different eyes, and fur color. As long as they don’t look like smurfs, gnomes and dwarfs. They have more animalistic traits and less human traits on their face as well. I’ve been really happy and satisfied with the progress made on the GYUP (though it really just became us working on a couple). At the beginning of this year, female yordles were… mostly just potatos, but now they’re much further along. There’s still a lot of yordles that need updating though, but we did make a sizeable chunk. Of the 11 Yordles, 4 are updated to new proportions (Heimerdinger, Gnar, Tristana, Poppy). We’ll be getting to them in time (hi Corki? ), but there is still work to be done. Also, somewhat related, but the new proportions do allow us to have a greater deal of freedom. Final Boss Veigar and Omega Squad Teemo also employ these to great effect. Hammer of Orlon, when she’s being official and sincere. ‘My hammer’ or ‘the hammer’ when she’s being casual (like, I am writing this on my laptop…but it’s actual rito’s laptop). There was a ‘ride the giant’ ult where she climbed onto the target and could periodically yank him toward a direction. Way too much clarity and frustration issues. Now grants 2.5 – 11 (scales with Champion level) bonus flat Armor and Magic Resist, changed from 15% bonus to both Armor and MR. Reworking Poppy was a chance to tune up her biggest, baddest character elements while giving her completely new play patterns. We knew the hammer, her signature weapon, would be critical in solidifying her refreshed identity; like Jinxâ€™s rocket launcher, Nautilusâ€™ anchor, or Rivenâ€™s sword, Poppyâ€™s hammer is an integral part of both her kit and her personality. We had to get it right for both to ring true. Poppyâ€™s new champion-smasher wasnâ€™t custom-made to fit her; itâ€™s a regular-sized hammer she wields with incredible power. â€œThe new hammer is more than a weapon,â€ Gem says. â€œIts humongous size contributes to her silhouette and her movement. No champion moves like her. When you see her swing that hammer, itâ€™s so different from Sion with his axe or Garen with his sword.â€ Senior narrative writer John Oâ€™Bryan adds, â€œItâ€™s almost like she puts all of herself into every swing.â€ The new hammer design contributed to Poppyâ€™s new ult and each of her re-tuned abilities. When others run away, Poppy runs forward. Sheâ€™s indomitable. Poppyâ€™s hammer is an important part of her personal journey. â€œA Heroâ€™s Call,â€ which offers players a glimpse into Poppyâ€™s world, is centered on the hammer and what it means to her. Oâ€™Bryan elaborates, â€œEven she doesnâ€™t think itâ€™s hers. She thinks itâ€™s a tool for someone else.â€ Scaling the hammer to make it a normal hammer size helps emphasize the idea that Poppy doesnâ€™t necessarily believe the hammer is hers to wield, that somewhere in the world is a hero meant to carry it. The hammer existed long before Poppy took possession of it. Though sheâ€™s been carrying the hammer for a long, long time, Poppy hasnâ€™t yet realized that sheâ€™s what gives the hammer its strength. Oâ€™Bryan explains, â€œIf you were to ask Poppy, she would probably think sheâ€™s nothing special. Everything sheâ€™s doing is because of this hammer sheâ€™s carrying around. But really, itâ€™s all coming from her.â€ Players know one thing Poppy doesnâ€™t: The hammer is right where it needs to be. The hallmarks of a great hero are almost always obvious, especially to the person displaying them. Almost always. Poppyâ€™s been tasked with delivering a legendary hammer to a hero who will become legend. Journeying through Runeterra, she uncovers a number of would-be wielders, but never suspects the hammer might have found the right person already. The power of the hammer, the responsibility of her mission. And a whole swath of new abilities to show off her true strength. Poppyâ€™s kitâ€™s designed to show off her might despite her diminutive stature; whether peeling for your allies by chaining CC like Hammer Shock and Heroic Charge, or plunging into the heart of battle to separate a carry from the crowd, Poppy shows that sometimes all you need in your toolbox is a really big hammer. Every several seconds, Poppy throws her buckler as her basic attack, gaining range and bonus magic damage. Once thrown, Poppy can pick up her buckler to gain a shield, but if an enemy walks over her buckler, theyâ€™ll temporarily destroy it. If Iron Ambassador kills the target, the buckler returns to Poppy instead of falling to the ground. Careful managementÂ of her passive is also essential to success in lane. You can use your buckler to last hit minions, trading basic attacks with your opponent because of your shield when you automatically get the buckler back. Keep in mind that if the buckler hits the ground, you can pick it up for the shield, but if your opponent runs over it, theyâ€™ll crush it out of existence (or at least until your passive comes back up). That interaction can turn into a mindgame with the opposing champ, because when you use the ranged attack for a bit of poke, you can set up Hammer Shock when they go to stomp on your buckler to fire both hits of the Q off. Unlocking Keeperâ€™s Verdict at level six opens a number of new options for Poppyâ€™s dueling potential: Quickly activating the ult without channeling simulates a souped-up Alistar Pulverize, while a fully channeled Verdict can even up a 2v1 or turn the tide entirely with jungle support. And donâ€™t underestimate the length of the knockback: Battering the enemy laner with a fully charged ult just as your wave is about to hit their tower means theyâ€™ll miss a ton of experience and gold. Creeping around a forest crowded with monsters is considerably less frightening when youâ€™rewielding a giant mallet. Creeping around a forest crowded with monsters is considerably less frightening when youâ€™re wielding a giant mallet, and the Keeper of the Hammer is more than capable of heading into the jungle, harvesting gold from camps and ganks. Setting up a Keeperâ€™s Verdict while hidden inside the brush can dramatically turn the tide when counter-ganking, because she can near-instantly transform 3v2s and 2v1s into a numbers advantage for her team. 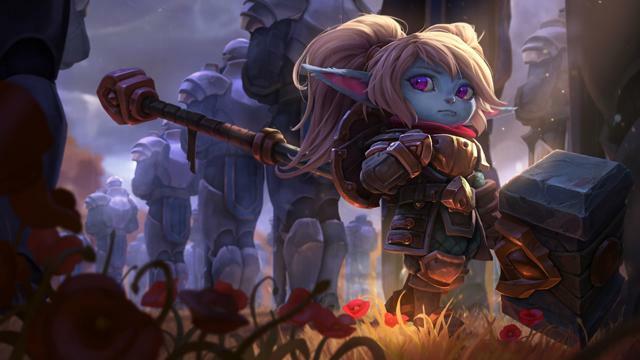 When itâ€™s time to transition to more teamplay, Poppy joins the frontlines as a strong tank. With the passive stats from Steadfast Presence, sheâ€™s surprisingly durable while still capable of outputting damage in the right situation. In early mid-game teamfights, Steadfast Presenceâ€™s active effect will keep the backline from using dashes to flee as her team collapses on them. A well-timed Keeperâ€™s Verdict can turn a 5v5 scrum into a 5v4 slaughter, but sheâ€™ll have to pay attention to enemy crowd control. Because Keeperâ€™s Verdict is channeled, it can be interrupted by opposing champions. As enemies acquire more armor and health, Poppy smoothly swaps roles to take on the responsibility of keeping her friends alive. Steadfast Presence stops enemy assassins from diving (as long as they donâ€™t use blinks–but blowing their Flash might still be worth, depends on /all chat) while the threat of Keeperâ€™s Verdict will have even frontline tanks concerned they might be taking a trip back towards their fountain, far away from the fight. One trick with Keeperâ€™s Verdict is that the knockback effect is actually a very small AoE, not single target. If you can get the enemy team closely grouped together (with Oriannaâ€™s Shockwave, perhaps), you could potentially knock more than one of them out of the fray. Then your team can either chase the weakened foes down, or secure one of those nifty objectives strewn about the map. Morg can tee Poppyâ€™s targets up with long-duration Dark Bindings, turning enemy champions into enticing nails for the pint-sized pulverizer to pummel. But we do want to point out that while Poppy does mostly synergize well with folks like Morg and Amumu, Keeperâ€™s Verdict is sometimes less a hammer smash and more a double-edged sword slash. In teams that want to keep enemies nearby for hugs and wombos, Poppy can get carried away…erhm…carrying away opposing champions with Heroic Charge and Keeperâ€™s Verdict. Not only is J4 one of the best examples of the kind of guy Poppy figures should wield the hammer, they also have great synergy in teamfights and top lane ganks. The terrain created by Cataclysm is fantastic for charging heroically into, but J4â€™s knockup E-Q combo can also help Poppy land both hits of a Hammer Shock. Knocking a would-be assassin a mile back towards his base is all well and good, but it doesnâ€™t do a whole lot against someone who can return right where he was with the click of a button. It doesnâ€™t help that the second part of Ekkoâ€™s Phase Dive is a blink, so he can bypass Steadfast Presence en route to smacking someone with his bat. Add in his percent health damage and ability to maneuver out of her Heroic Charge hotspots, and you have a recipe for a champion Poppyâ€™d rather not see suit up against her. Both Jannaâ€™s Howling Gale and Monsoon can interrupt Keeperâ€™s Verdict, and generally speaking the Stormâ€™s Fury is more than capable of keeping Poppy away from targets sheâ€™d prefer thumping with a giant hammer. Because Poppy lacks a real gap-closer, Jannaâ€™s extra movement speed from Tailwind doesnâ€™t do the yordle warrior any favors either. Irelia hits Poppy where it really hurts: right through Steadfast Presenceâ€™s bonus resistances in the form of true damage. While Irelia canâ€™t Blade Surge through Poppyâ€™s W active, she can stand toe-to-toe with the Keeper of the Hammer and trade basic attacks. Having extra armor and MR below 40% health is normally enough to keep Poppy in the thick of a slapfest, but true damage ignores those fancy numbers, leaving Poppy in a dangerous spot. Let us know your thoughts on the tiny champion packing Leagueâ€™s biggest wallop in the comments below!